On sale now at Musician's Friend! 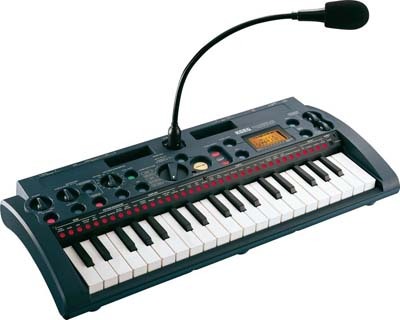 eBay's used Korg MicroSampler listings. The Korg MS1 microSAMPLER is a cool little synth that allows creativity to come naturally. Includes fourteen-voice polyphony, reverse playback, time stretching and other useful features. Eight storage banks in internal memory. Keyboard mode for instant playability of samples. Sound editing software included, you can also use your own DAW software. The microSAMPLER can run on batteries, so you can capture samples anywhere. Both line input and mic input are provided to allow a range of input sources including electronic musical instruments, CD, and voice. A gooseneck microphone is included and convenient caddies are located beside the mic jack, providing a cradle for your MP3/audio player when using it as a sample source. The pattern sequencer uses an overdub operating style that lets you continually layer your performances. You can switch between patterns during playback for seamless performances. Up to sixteen patterns (16,000 notes per pattern, or a maximum 64,000 notes) can be stored in each bank. Developed for Korg's KAOSS PAD series, the effect engine holds it's own, with twenty-one effects, including not only the usual delay and chorus selections, but also ring modulator and grain shifter, and a Looper effect that's easy to use. The effects can be applied to any sound while resampling, allowing the effects to be used over and over again for more sonic expression. The proportion of the black keys and white keys has been increased, so chords are now easier to finger, and the touch has been improved so that rapid phrases can be played more easily and with less fatigue. The controllers are laid out on the front panel, and the status of the samples assigned to each key (and the item being edited) is indicated by the lit state of the LEDs running along the top of the keyboard. Using the free editor/librarian software for the microSAMPLER, you can manage a gigantic sample library. You can back up sample and pattern sequence data to your computer via USB, or load samples and patterns back in easily. Importing and exporting of WAV/AIFF data on your computer is also supported. Buy it now at Musician's Friend! Prices updated every fifteen minutes. Low prices on slightly pre-owned or cosmetically imperfect keyboards and music gear. This page may make use of content from Wikipedia, licensed under the GNU Free Documentation License.